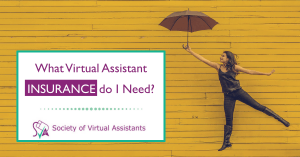 Virtual Assistant Insurance - What do you need as a UK VA? Virtual Assistant Insurance Claims - what can go wrong? This covers you if you make a mistake and the client suffers a material loss. You can indemnify yourself via T&CS/contract, but it could be argued that an element of your fee is for professional services and the client is relying on you to perform your job properly. The likelihood of a court upholding that claim is increased the more you charge. Cover for VAs is generally £1million and there can be a limit on each claim or the insurer may just cover you up to the value of the whole insurance policy - it's very important to check this! You need to assess what the likely exposure is if you get something wrong. E.g. a medical secretary could mistype a dosage and kill someone, whereas someone typing a fiction book will just have a typo in the book. Those offering riskier services should consider upping the cover - I'd say people doing medical transcription, accountancy/bookkeeping, or with a large turnover need extra cover. This one often gets left out of VA policies because the VA doesn't see why they need it if they work from home. Technically if the postie trips on your pathway while delivering business mail, they could claim against you. If you meet a client in a coffee shop and spill coffee all over their laptop, this would cover you. The overall cost is about £30 a year, so not a massive amount for peace of mind. Again we know VAs who think they don't need this as they are covered under their home insurance... But not if you use the computer for work! Make sure the replacement value is covered - add up how much it would cost to replace computer, printer, and all the software you might have to repurchase. This protects your business against losses resulting from cyber attack or hackers... Some cyber insurance will also protect you against accidental data breach - you need to check if this is included. It should cover investigation costs and also costs of continuing in business whilst you sort out the attack. FSB include £10k of 3rd party cyber cover and £5k of first party cover in their standard membership - their average claim for cyber insurance is £3k per claim. Legally you MUST have this if you have employees. That includes if you are a limited company and the sole employee of the company. A lot of VAs will insist their subbies have insurance cover before working with them. In theory this works. In reality, your client is going to pursue you for any losses and then you would have to claim back losses from the subcontractor VA's individual insurance - meanwhile you are out of pocket. Levels of cover vary hugely between different policies, so unless you've requested a copy of the insurance policy, the work may not even be covered under the scope of the VA's policy. Or they may have a relatively small maximum single claim limit. Bear in mind that your own insurance may not pay out if you haven't told them about subcontractor's working in the business. Tell your insurer, get them covered regardless of whether they have their own insurance. You need this if offering bookkeeping and accountancy services. It will increase the cost of your insurance, but it's better than making a claim only to discover you've invalidated your insurance cover by offering this service. (Plus check if you need to be registered for Anti Money Laundering Regulations!). If you've been working without professional indemnity cover for some time, you might want to include a retrospective policy which covers work done to date. The size of businesses you work with - some will insist on a much higher level of professional indemnity coverage than is standard for VA cover.